If you live near a Rexall store in Ontario, you can pick up some discounted gift cards starting tomorrow. 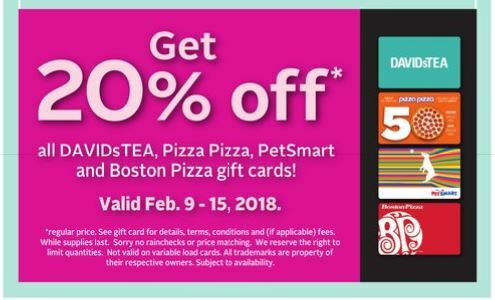 Save 20% on all Boston Pizza, DAVIDsTEA, PetSmart and Pizza Pizza gift cards from February 9th to 15th. This is a better deal than Canadian Tire for Boston Pizza and DAVIDsTEA and we all know how expensive pets can be, so 20% off your Petsmart purchase is always good. It is adopt-a-thon weekend at Petsmart and while you can’t use the gift card on your new pet (they deal with rescues that you pay directly), you can use the gift card to save on all the food, toys and treats for your new furry friend. If it is a store or restaurant you buy from frequently, buy them now at 20% off to make your own deal at the retailer later. See the Rexall flyer for this deal here.